MDT-Tex is a German family owned company, founded in 1990. 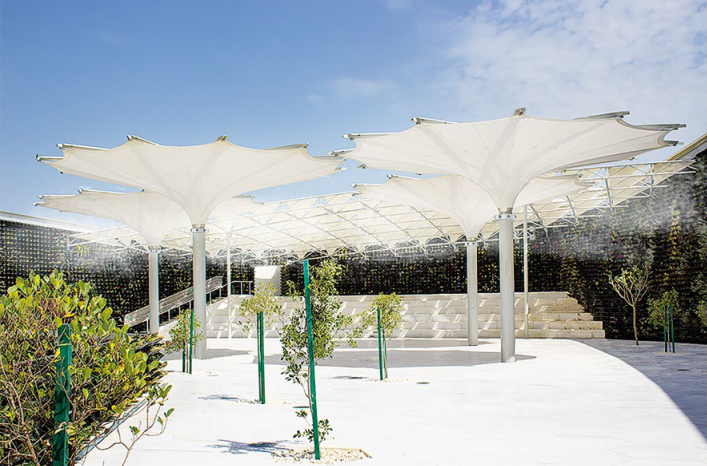 MDT designs, manufactures, and supplies innovative, high quality sun protection systems, membrane constructions, and custom made products for outdoor textile architecture to customer all over the world. The company carries out the entire production process in its own cutting edge factories at international locations. This guarantees the highest quality for innovative products and ensures absolute supply security. Yearly, around 40.000 umbrellas in different sizes and designs are manufactured and sold to high end customers providing shading and sun protection for millions of people every day. for particularly windy areas. The cover is easily replaceable, is made up of individual textile segments specially coated to withstand exposure to sunlight and rain. or in a group. Strong structural and membrane elements allow their usage in extreme weather conditions. Rainwater flows off between the mast pole and an adapted cladding and can be drained either into the ground or, in the mobile version, above ground, depending on situation. Condair is a Swiss family owned company founded in 1948. 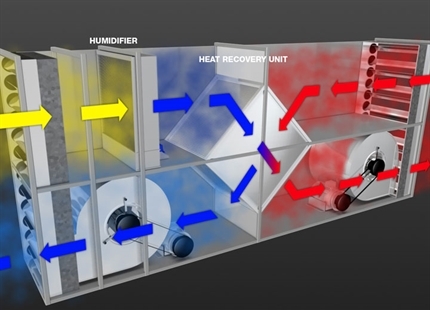 Condair is the leading manufacturer and provider of complete solutions in the areas of humidification and evaporative cooling, with a comprehensive portfolio including products, services, experience and know-how. Our brand Condair, sets the standard for innovative, energy efficient and hygienic solutions. Today, with approx. 650 employees, we operate production sites in Europe, North America and China, are active in 17 counties by our own sales and service organizations and supported by distribution partners in more than 50 locations worldwide. 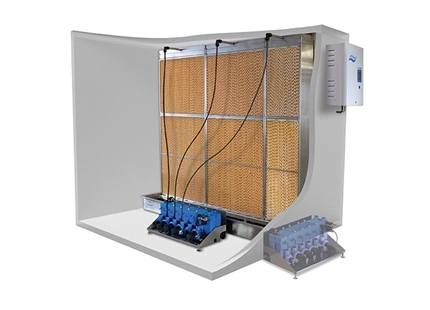 The evaporative cooling effect is achieved by atomization of pure, clean and fresh water. The water is treated in a Reverse Osmosis cleaning proses, where all salts and minerals are removed before it passes through a UV system, and is pumped out under high pressure to the misting units on the umbrellas. 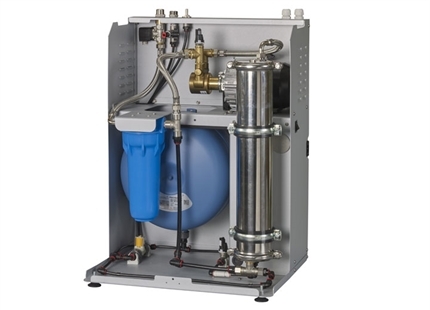 The units meets the highest hygiene standard on the market, and ensures that the evaporated water is always safe and clean. 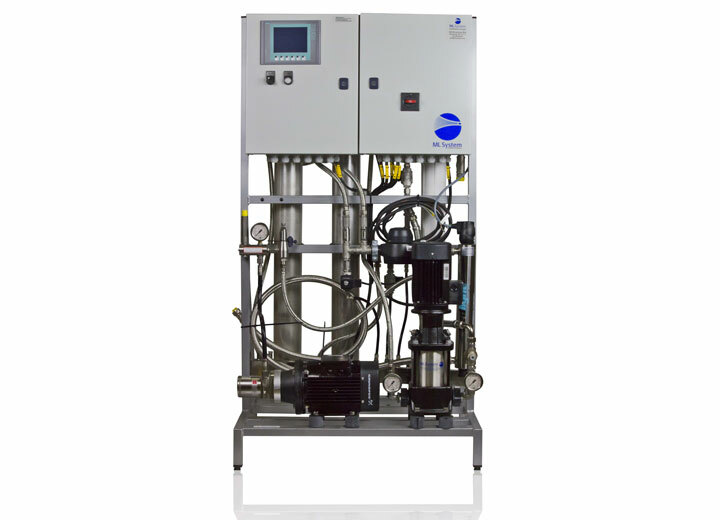 The combined watertreatment and high pressure units are build in high quality materials according to ISO 22.000 Hygiene Management System, and ensures many years of trouble free operations. The full system is risk evaluated and meets international hygiene standards, like e.g. L8, ASHRAE 188 etc. 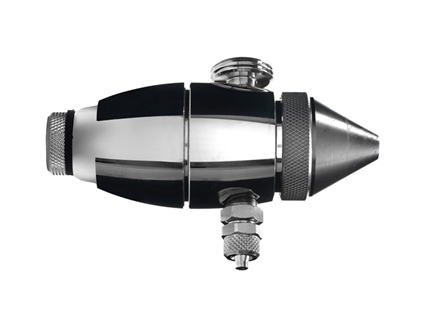 Evaporating water using high pressure is super efficient and requires only a minimum of energy. The cooling effect achieved with evaporating 100 L of water is as high as 68 kWh. The energy efficiency ratio (EER) is minimum 30, depending on the size of the complete installation. 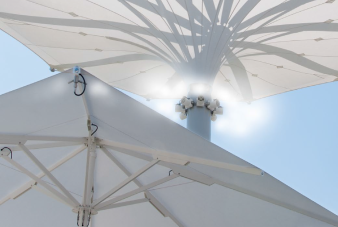 Misting unit integrated into the mast, distributes the atomized water and creates a cloud of cool air under the umbrella. Each pump system can be used for several umbrellas. Contact your local Condair outdoor cooling expert.